Entries from Digital Intelligence tagged with "htc"
Gaming firm Valve has partnered with Taiwanese smartphone and tablet maker HTC to make a virtual reality headset, in a bid to rival Facebook’s upcoming Oculus Rift device. Samsung has revealed its first smartphone with a metal body, dubbed the ‘Galaxy Alpha’, as the world’s biggest mobile maker looks to expand into a more premium style to compete with HTC and Apple. 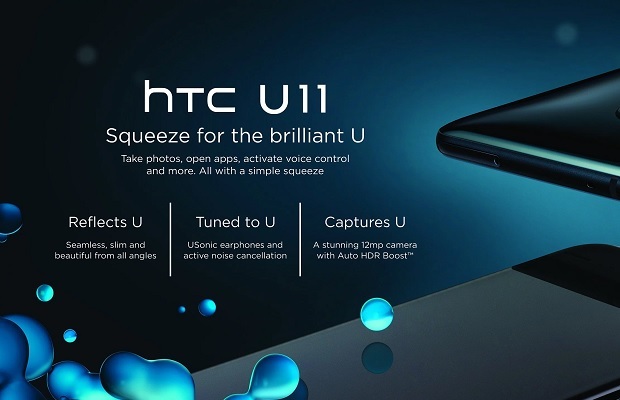 HTC has unveiled the One (M8) smartphone, the follow up to its biggest selling model last year, as the Taiwanese firm looks to rival Samsung and Apple in the high-end smartphone market. Samsung has registered a patent that could hint at its own Google Glass-style wearable device, as the electronics giant continues to expand into the wearable technology field. Samsung expects to see a profit of £5.8bn for the past three months as its smartphones outsell Apple globally, shipping around 85 million devices, compared to some 35 million iPhones. HTC debuts 'Change' brand platform, fronted by Robert Downey Jr.
HTC has unveiled a new brand platform fronted by ‘Iron Man’ actor Robert Downey Jr, in what the phone maker is calling its ‘most ambitious campaign to date’. Brands are ignoring less popular mobile operating systems at their peril. A new report indicates that the top 10 mobile devices account for only 48% of total traffic, with regional variances leading to an increasingly broken experiences for users. Apple planning larger iPhones for Autumn launch? Apple is planning on launching larger size iPhones to rival the likes of Samsung’s Galaxy S4 and the HTC One, according to a new report. Amazon, Google, Facebook and YouTube are amongst the top 12 brands favoured by the UK’s ‘Generation Y’ of 16 to 34 year olds, according to a new survey. Samsung, Google and Apple continue to extend their dominance of the US mobile market, according to new data. iPhone 5 pics leaked: Larger display to compete with Samsung? The front panel from Apple’s iPhone 5 has been leaked online ahead of the device’s highly anticipated September 12 launch, according to a news report. The pictures, published by smartphone repair firm ubreakifix, appears to confirm rumours that the iPhone 5 will feature a larger display than its predecessor, bringing the device in line with current Android flagship devices like the Samsung Galaxy S3 and HTC One X.
Android-based devices are outstripping Apple globally in terms of popularity, with Samsung leading the way, according to new research. The findings, from Gartner’s second quarter 2012 market share data, showed that Samsung shipped 30% more smartphones in the quarter than the same period in 2011, extending its lead over Nokia and Apple. Samsung continues to lead European smartphone market, and the Galaxy manufacturer now has five of Britain’s top 10 best selling handsets. Samsung has increased its European market share to 45 per cent, while RIM has found its share in the UK fall to 10.9 per cent, compared to 21.6 per cent at the same point of last year, according to market data company Kantar Worldpanel ComTech. This chart represents the popularity of phone manufacturers among 234 million US mobile phone subscribers. 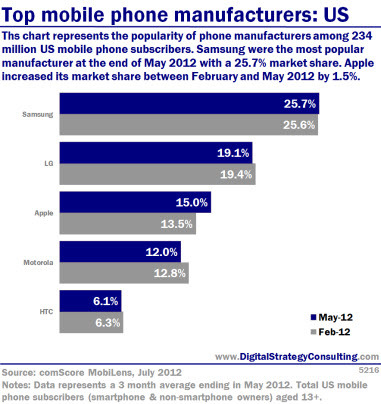 Samsung was the most popular manufacturer at the end of May 2012 with a 25.7% market share. Apple increased its market share between February and May 2012 by 1.5%. Blackberry maker Research in Motion (RIM) is delaying the launch of its new phone operating system Blackberry 10 and is to cut 5,000 jobs. The move comes as the Canadian smartphone pioneer struggles to keep up with Apple, Samsung and HTC in the increasingly competitive smartphone and tablet markets. When it finally launches, Blackberry 10 will feature 3D effects and has been designed to make it easier for developers to port Android apps to help bolster the amount of software available on the touchscreen phones it will power. 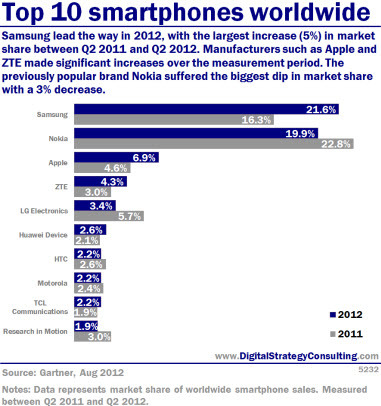 Samsung leads the way as the top smartphone seller in the world, followed by Apple, according to new research. The data, from research firm IDC, indicates that Samsung sold 42.2 million smartphones worldwide during the first quarter of 2012, earning it a 29.1% market share. Apple sold 35.1 million iPhones, helping it to secure a 24.2% market share. Samsung is selling the most smartphones worldwide, but Apple is making the most money, according to new research. The study, from Juniper Research, indicates that almost 60% of the 139 million smartphones shipped worldwide in the first quarter of this year were either Apple (35.1 million) or Samsung (46.9 million) devices. HTC is the most popular Android handset make across the leading five countires in Europe, followed by Samsung, according to new research. The study, from comScore, looked at growth trends of the smartphone platforms across the five leading European markets (France, Germany, Italy, Spain and the United Kingdom). HTC is to sue Apple over patent infringenments, after Google sold the Taiwanese smartphone firm the rights to some of its technology. HTC has used patents it bought from Google last week to lodge a fresh complaint against Apple with the US International Trade Commission (ITC).It has alleged that Apple's computers and mobile devices infringe patents involving wi-fi capability and processor communication technology.